Opening celebration Saturday, March 23, 2019, noon – 7 p.m.
SEATTLE, Jan. 31, 2019 – An exciting new arts and cultural hub opens in Seattle on March 23, 2019, when ARTS at King Street Station debuts with the dynamic exhibition yəhaw̓, which presents some 200 works showcasing contemporary Indigenous creatives. ARTS at King Street Station was conceived as an innovative, community-powered arts and cultural hub that encompasses art, artists and culture through the lens of racial equity. The exhibition space provides a holistic view of art and the people who make, consume and live it. Informed by an extensive community input process, ARTS at King Street Station was conceived to reflect the creativity and talents of people that continue to create the fabric of Seattle. On view through Aug. 3, 2019, the inaugural exhibition yəhaw̓ (pronounced yee-hout) will open ARTS at King Street Station, an historic space now dedicated to increasing opportunities for communities of color to present work. 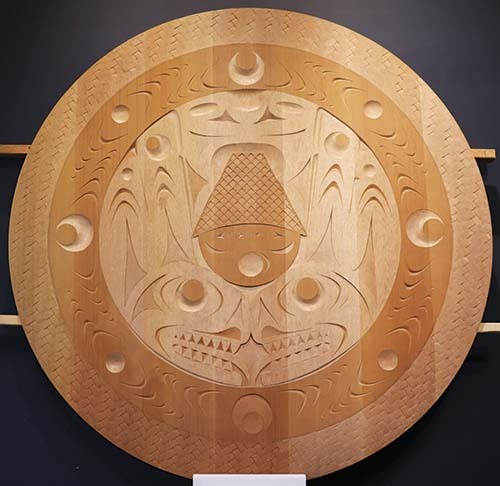 “It is fitting that we inaugurate the space with a nod to the incredible artistry of the Coast Salish peoples, on whose land the City of Seattle is built,” says Randy Engstrom, director of the Office of Arts & Culture (ARTS). 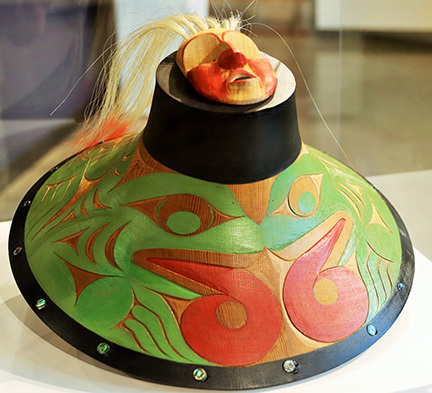 The exhibition title yəhaw̓ is drawn from the Coast Salish story that tells of Native people from all tribes uniting around a common cause and lifting up the sky together. Appropriately, yəhaw̓ reflects a nuanced, inclusive narrative that firmly establishes Native creatives as belonging in the here and now. Prior to the culminating exhibition that opens March 23, yəhaw̓ has encompassed satellite installations throughout the region, performances, artist-in-residence, a publication, art markets, in an expansive, yearlong project. All Indigenous creatives living in the Puget Sound region were invited to participate in the yəhaw̓ project, and all who applied had the opportunity to have their work represented in the programming. Conceived and curated by Tracy Rector (Choctaw/Seminole), Asia Tail (Cherokee Nation) and Satpreet Kahlon, the resulting yəhaw̓ project features the work of some 200 creators of all backgrounds and experience, in disciplines including sculpture, photography, design, printmaking, woodworking, film, metalwork, glass and textiles. Several artists were commissioned for site-specific artworks, including Chai Adera, Natalie Ball, Demian DinéYazhi´, Malynn Foster, Sara Siestreem, Adam Sings in the Timber, Timothy White Eagle, Christine Babic and more. 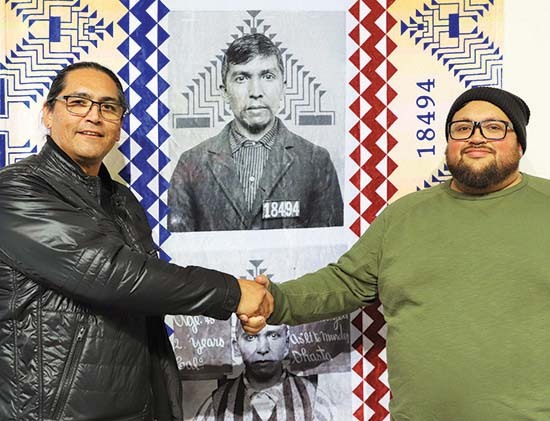 In addition, 10 emerging artists, such as Priscilla Dobler, Randi Purser and Asa Wright were selected to participate in a mentorship program, receiving artistic guidance from established Native artists. 10 am – 6 pm, and First Thursdays, 10 am – 8 pm. Admission is free. 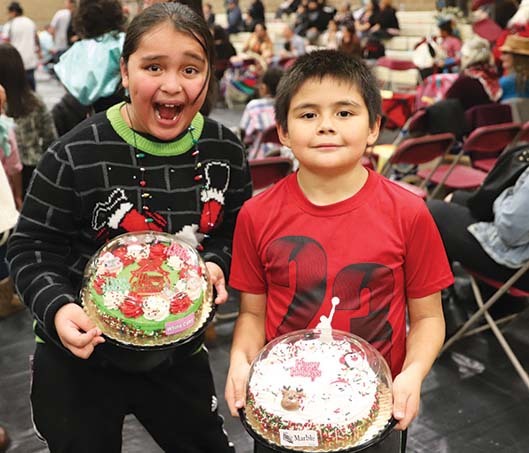 Families traveled from near and far to celebrate Indigenous culture and Christmastime at the 5th annual Tulalip Tribes and Marysville School District (MSD) Indian Education Christmas Powwow. 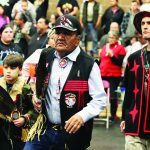 On the evening of December 15, the Francy J. Sheldon Gymnasium was at capacity and rocking as local Veterans kicked off the ceremony, leading the way during grand entry. 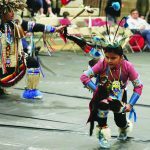 Dancers draped in beautiful regalia, that showcased their beading and seaming talents, competed in a number of categories including fancy shawl, jingle and traditional dances. 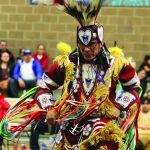 The crowd was highly interactive, cheering on their loved ones as they hit the floor to honor the traditions of their ancestors. 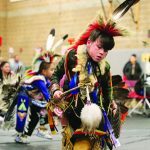 Babies to elders engaged throughout the entire evening, dancing in circles around the gym to hypnotic drum beats provided by five drum circles. Across campus, at Marysville Mountain View Arts and Technology High School, Santa Clause paid a visit to drop off gifts donated by Toys for Tots, as well as a handful of community members. 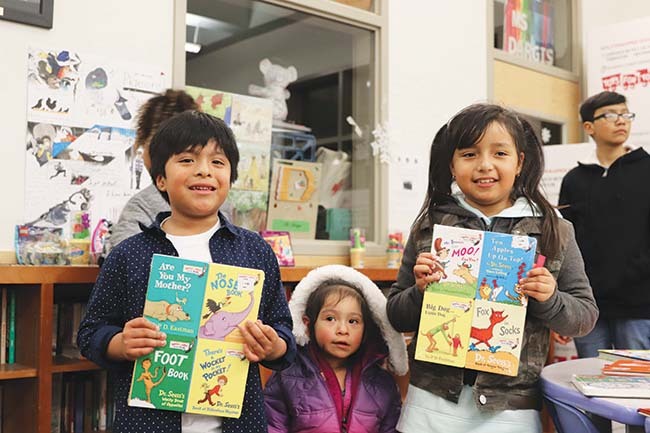 While Ol’ Saint Nick stuck around for a bit to take photos with the families, the kids checked out all of the toys and got to pick one present each, choosing from a selection of stuffed animals, Hot Wheels and books. 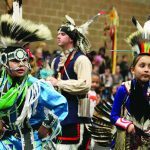 Generation after generation, the Coast Salish tradition of wool weaving was historically passed down from mother to daughter, since the beginning of time all the way until the years of assimilation. 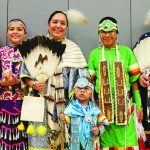 The art of creating clothing, regalia and blankets from wool was nearly lost until it saw a sudden resurgence in the early 2000’s. Of course, the tradition wasn’t completely lost, after the boarding school years a number of families continued to practice weaving. 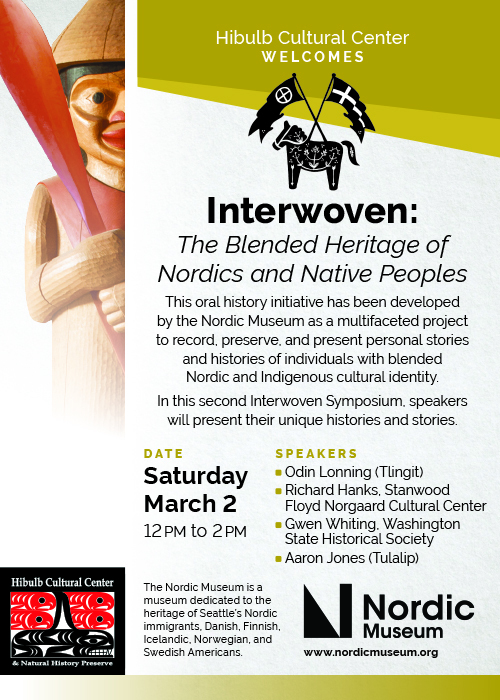 Both oral history as well as several artifacts served as reference points when bringing back traditional wool weaving. 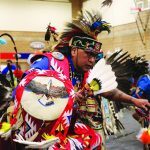 Master Weavers Betty Pasco (Suquamish), Danielle Morsette (Suquamish), Dr. Susan Pavel and Frieda George (Sto:lo Nation) are among the few names who deserve the most credit for the revival. 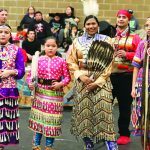 These ladies took it upon themselves to host a number of classes on local reservations to teach tribal members the tradition that seemed to be fading from existence due to the advancement of technology. 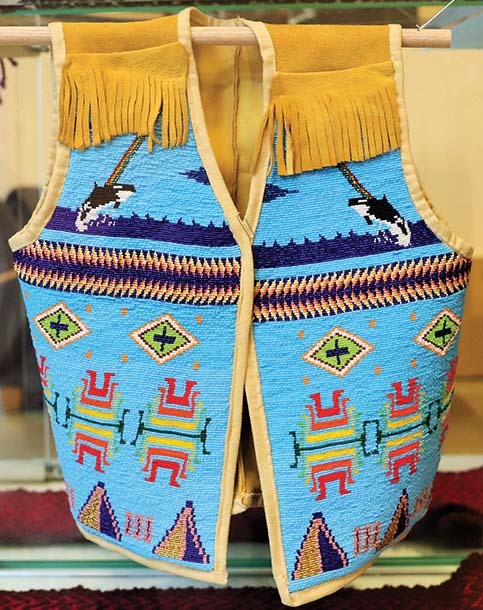 The revitalization allowed Coast Salish people to reconnect with the tools and textiles our ancestors created, as well as reflect on the significance certain woven items possess within tribal communities. 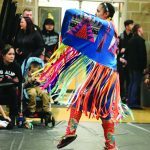 Now all of the students from the wool weaving resurgence are passing their knowledge down to the next generation as more and more tribal members want to learn how to traditionally weave blankets and regalia, as well as the history of wool weaving. 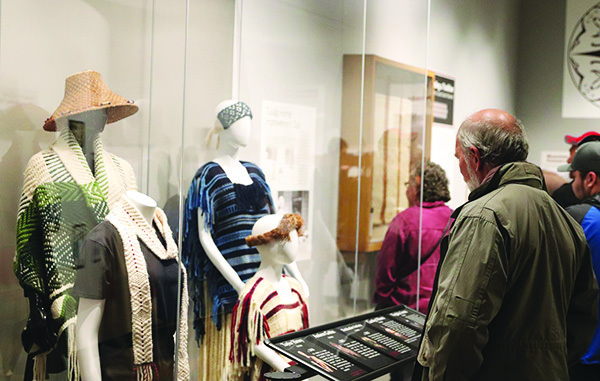 On the night of November 2, Tulalip and surrounding communities gathered at the Hibulb Cultural Center (HCC) for an exclusive first look at the museum’s new exhibit, Interwoven History: Coast Salish Wool. As the guests entered the museum’s longhouse they were welcomed by HCC Senior Curator, Tessa Campbell. Woven tapestry by Frieda George. Master Weaver Frieda George traveled all the way from Chilliwack B.C. with her family and was honored as the evening’s guest speaker. 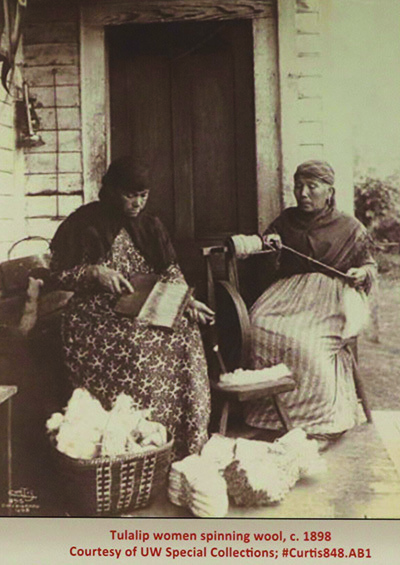 Frieda recalled first learning how to weave as a child, when she would visit with her grandmother. She also stated that she is a fourth generation weaver and has carried the tradition for her entire life, sharing her techniques with Coast Salish people for decades. 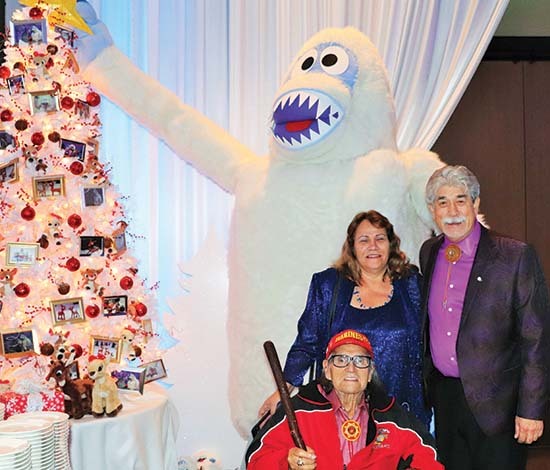 Frieda’s daughter, Roxanne, then took the floor to share a story about how her great-great-grandmother used to cleverly place branches along pathways in the Canadian mountains where mountain goats were known to pass through. After a few days, she would return to the mountains and collect all of the fur from the branches to use for weaving traditional blankets. Museum attendees were free to explore the new exhibit in an open-house style setting. 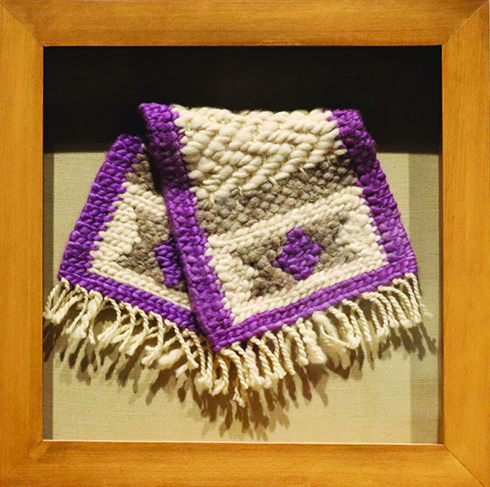 Upon entering the exhibit, your eyes immediately meet a beautiful wool woven shawl that was gifted to Tulalip Board of Director Mel Sheldon. You’re then taken on an interactive adventure that is fun for the entire family. 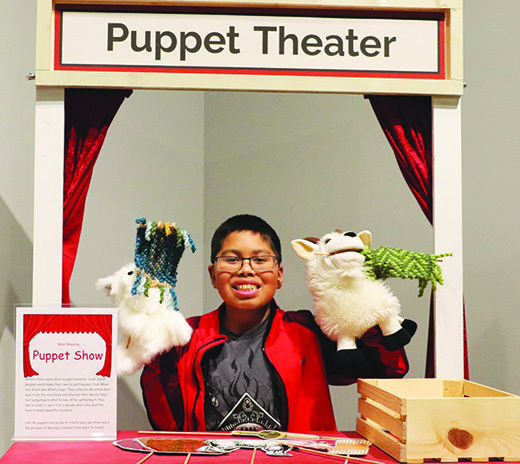 The exhibit features a number of hands-on activities for the youth including a puppet show, a touch-screen weaving game as well as a sensory station. 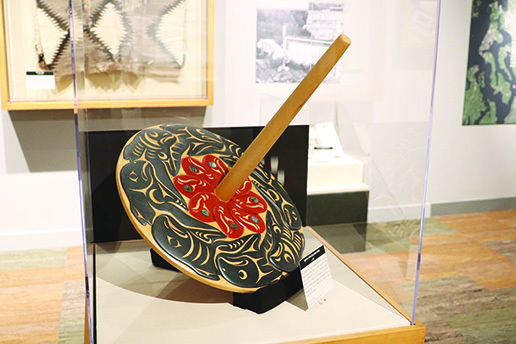 On display were a number of pieces created by Tulalip tribal members including a spindle whorl by Tulalip carver Mike Gobin and several regalia pieces woven by a number of Tulalip artists. “I did two pieces for this exhibit, a speaker sash with a matching headband,” explains Taylor Henry. 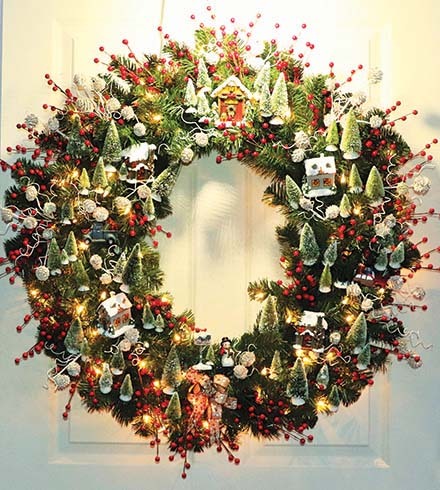 “I’ve been weaving since 2014 and have been beading since 2004. 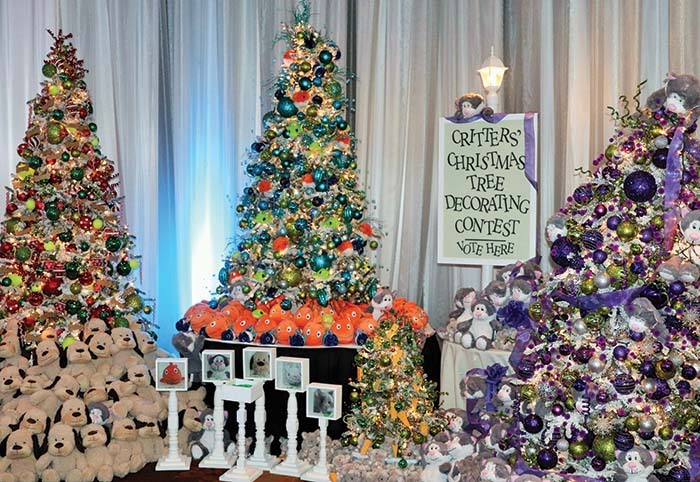 Once I mastered beading, I wanted to expand my knowledge and put my hands in other textiles. I did these pieces on my own, it was my second project that I made on the loom my auntie Marci gave me. I wanted to stick with traditional colors, I did the natural white and brown, I didn’t want to go too contemporary. Traditionally, the Coast Salish people utilized fur from mountain goats as well as from wooly dogs when weaving. Wooly dogs were a breed that the Northwest tribes held in high regard because of their fur, so much so that tribes kept the dogs on nearby islands away from village dogs to prevent crossbreeding. In his expedition log, Captain George Vancouver stated that the wooly dogs resembled pomeranians but larger. The dogs were sheared every summer and their wool was used to prepare for the upcoming cold seasons. After the arrival of blanket manufacturers like the Hudson Bay Company and the importation of sheep, tribes no longer had to use wooly dog fur as sheep fur was more water resistant and blankets became easily accessible. Tribes eventually brought the wooly dogs back to their villages and because of crossbreeding, the breed went extinct in the early 1900’s. 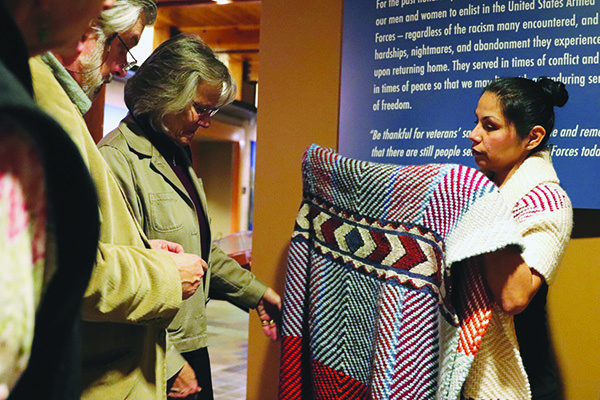 Shortly after the opening of the museum, HCC sent a traditional blanket to the University of Victoria so they could determine what type of fabric was used to create the blanket. The university recently contacted the cultural center with the results and to great surprise, the blanket was comprised of both mountain goat and wooly dog fur. Master Weaver Tillie Jones held a live demonstration during the exhibit’s first night. On large looms, she displayed two of the projects that she’s currently working on and explained the many intricacies and the importance of weaving. Tillie is currently hosting a six-week course at the museum, teaching the community the art of wool weaving. The class immediately filled up upon its announcement but she encourages you to call HCC and request to be put on a waitlist for the next course and to visit the Interwoven History exhibit in the meantime. 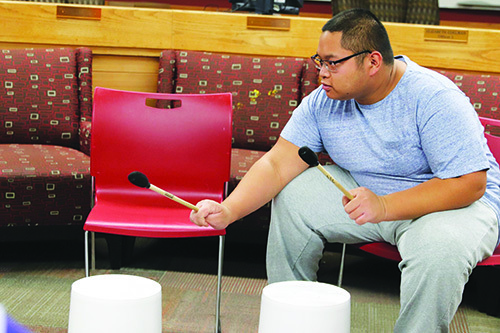 For one hour, every Monday evening, the Tulalip Youth Council board room is turned into a music studio where a live rock band rehearsal takes place. As you approach the building, you hear the sound of drum patterns increasing and decreasing in pace and volume, accompanied by small fits of laughter. In the middle of the youth council chambers was a small circle of young musicians banging out beats on large paint buckets. The band is so caught up in the moment and exuding so much joy that their smiles become extremely contagious and every four measures somebody ends up making the entire group crack up with just a grin. 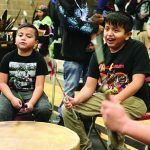 As the drums started to decrescendo, a voice that many local youth would instantly recognize, began to sing the hello song, welcoming everybody to the rehearsal. Victoria Fansler, of the Snohomish County Music Project (SCMP), led the band with the first song of the day. 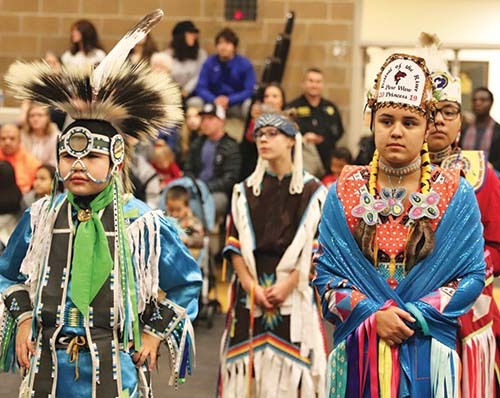 Victoria often works with the Tulalip youth at the Betty J. Taylor Early Learning Academy, Quil Ceda Tulalip Elementary and many other schools and tribal programs, helping the kids overcome traumatic experiences through music therapy. 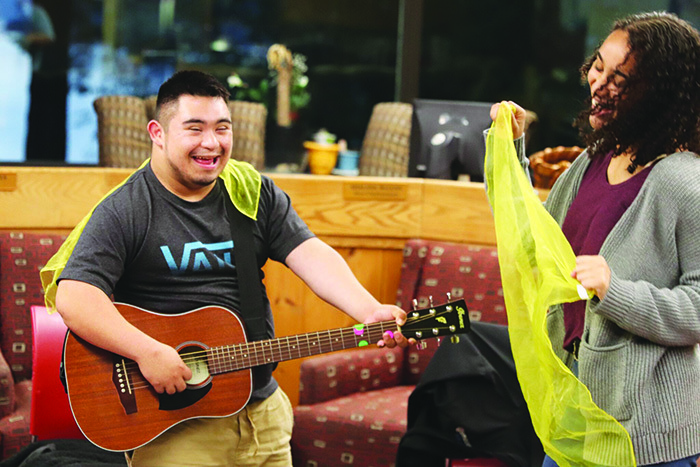 Over a year ago, representatives of SCMP attended a meeting held by the Tulalip Youth Services Inclusive Advocacy Committee, and from the meeting, Music yoU ROCK was created – an interactive, inclusive rock band instructed by SCMP Music Therapist, Colby Cumine. After Victoria welcomes everybody to the class, the band practices a few more rhythmic exercises before Colby calls upon someone to pick a song the class can get down to. Colorful scarves are passed out as Colby queues up the jams on his phone. Once the beat drops, everybody is out of their seats, dancing and waving their scarves. 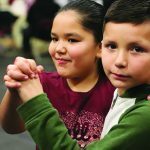 Following the dance party, the group picks the instrument and partner of their choice and begin practicing a song. This particular day, the band worked on the Michael Jackson classic, Billy Jean. After practicing with their partners, the band reforms their circle in the middle of the room to perform the song altogether. “Music is a level playing field, everyone enjoys music in some form or another,” adds Colby. 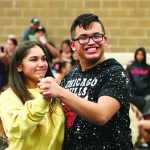 “In the music therapy setting, we don’t emphasize how well you can play the instrument but how much fun you’re having while playing the instrument. So if you’re a super talented guitar player who can play all the chords, licks and chops, or if you’re just strumming along having fun, both of those are equally as successful in this program. Before the class ends, Victoria sings farewell to her bandmates. Many of the musicians meet up briefly after the class to discuss their day and speculate on how much fun next week’s class will be. 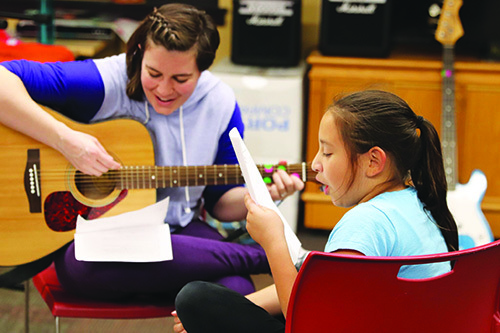 This quarter, the band was joined by future music therapists Lindsey and Kesha, Seattle Pacific University music therapy practicum students. 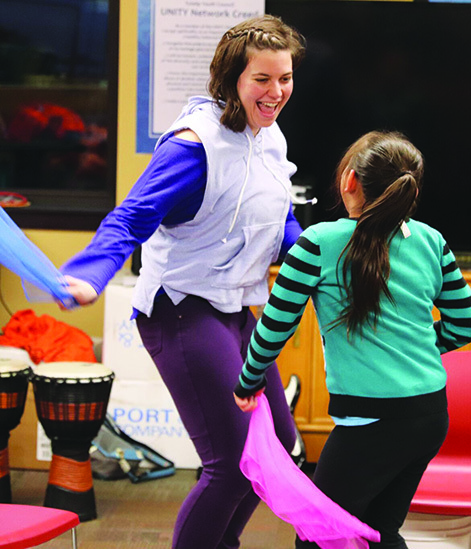 Throughout the entire session, the young ladies assisted the musicians with chords and tempo and shared laughs during both of the dance and drumming sessions. The musicians will continue vibing out the Youth Council board room every Monday from 4:30-5:30 p.m. until December 17. Towards the end of Music yoU ROCK, the band will record a few of their hits and have a listening party on the last day of the program. 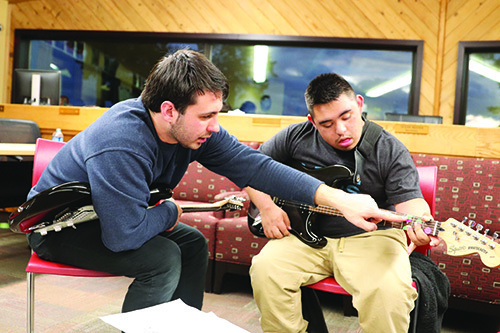 Music yoU ROCK is funded through the Developmental Disabilities Administration (DDA). 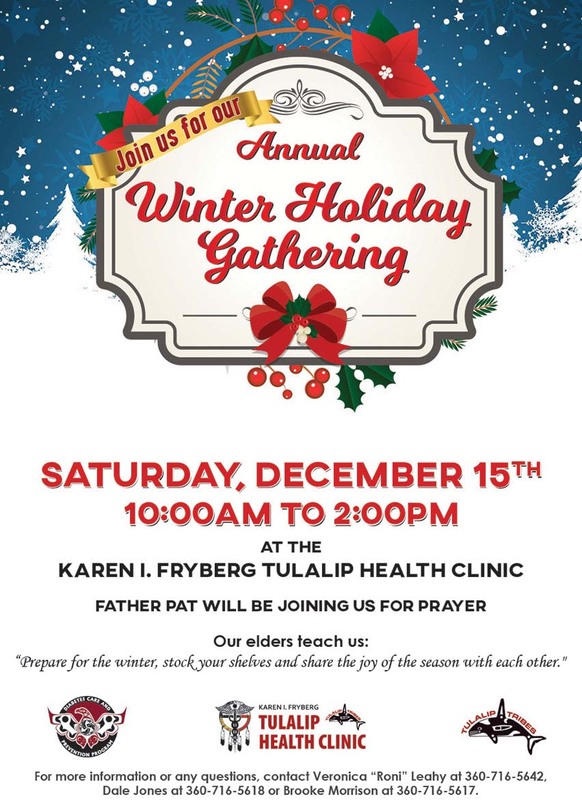 The program is open to the entire community. Those who are DDA participants can attend the program with no charge. For non-DDA particpants, the cost of the progam is $220. 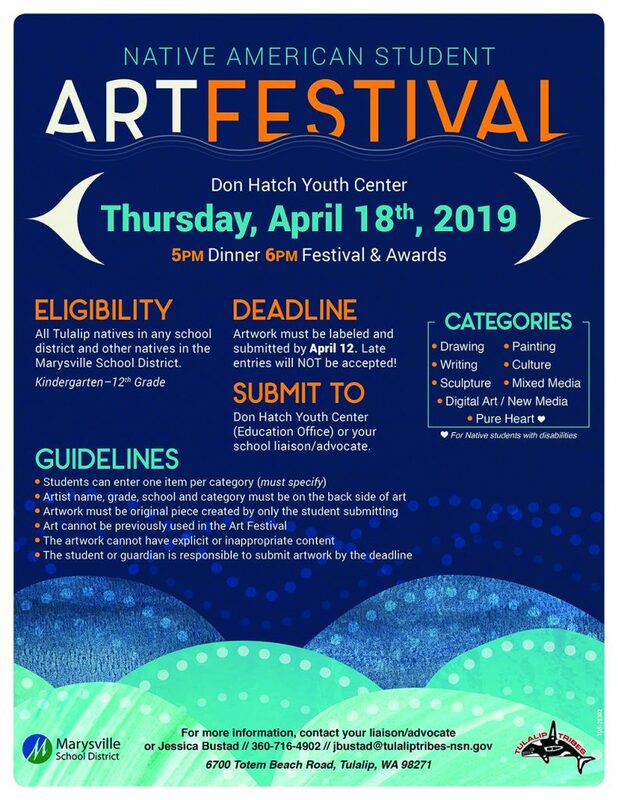 For more information, please contact Tulalip Youth Services at (360) 716-4909 or the Snohomish County Music Project at (425) 258-1605.